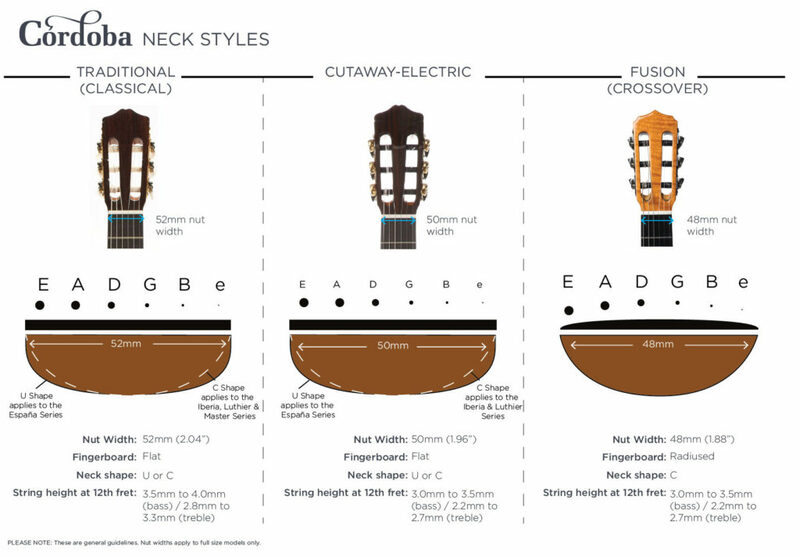 We use 3 basic neck styles: Traditional (Classical), Cutaway-Electric, and Fusion (Crossover). These styles vary on nut width, fingerboard shape (flat or radiused), the neck profile and string height at the 12th fret. These four factors will have a direct effect on the playability of a particular instrument and the general feel of the neck. Our Fusion series guitars are all built with the Fusion (Crossover) style neck. The thinner nut width (48mm), the rounded neck profile, and the curved radiused fingerboard make these guitars adaptable for many styles of playing, appealing to many guitarists and even players with smaller hands. Traditional (classical) guitars such as the C5, 45MR, or the Solista feature a wider neck (52mm nut width) with the flat fingerboard and U shaped neck profile. Guitars that have a cutaway such as the GK Studio and the 55FCE have neck style and profile that are in-between the Fusion (crossover) and Traditional (classical). Curious about your guitar’s neck style? This new spec is listed in each guitar’s specs!